Even my daily routine is romantic. It involves walking my children, in their school-issued blazers with my daughter in a straw boaters cap, down rows of Victorian houses to their school, where they enter an edifice built sometime in the 1700s. I then return home to work, stopping along the way at local organic shops for produce, passing by the street vendors on Portobello Road, ducking and weaving through packs of tourists with cameras drawn. Even the weather is something to behold. In the summer, the days last forever. Sun-up happens when at 4 A.M. and sundown can be well past 9 P.M. Runners are out in the parks well before the park staff wake up. After work, buildings in London expel their contents onto grassy squares, royal parks, and river banks while friends gather, with bottles of rosé and picnic baskets, soaking up the daylight as if to store if for later in the year. The winter contrasts deeply with the summer. In the winter, sun-up is at a lazy 8 A.M. and sundown rushes along at 4 P.M. On those days, the city takes on a different vibe: Commuters stream by with their collars turned up against the damp and colorful scarves are neatly tucked into city-sensible black wool coats. The young, the elderly, and families take shelter in their local pubs for the comfort of warmth, conversation, and shelter from the damp. This is one of the most magical things about living in England: Pubs here are not solely drinking dens. They are gathering places for families, they are community hubs, and they are escapes from work and from home. They serve as family and social gathering places and they serve to strengthen social networks, support the community, foster tradition, and provide a meeting ground. Many pubs, in fulfilling their role as community hub, serve food, as well. Some serve food that is better than others but one staple of pub food, at any level, is soup. It is easy to prepare, simple to fancy-up with a bit of garnish, can be served quickly, and during the majority of the year, when cool weather and damp skies abound, it is particularly appealing. A few recurring soups are Minted Pea or Roasted Cauliflower and there are always creative options served at the gastro-est of pubs, like Parsnip and Cumin Soup with Orange Sour Cream. Every so often, however, regardless of how upmarket a pub is, they pull out an old favorite from the archives. They look for a soup that is a perfect antidote to damp, dismal weather and something that will fill you with warmth and comfort. This is when you see Broccoli and Stilton Soup go up on the chalkboard menu. Simplicity is essential here. Whether a disinterested kitchen employee or Le Cordon Bleu-trained chef, when Broccoli and Stilton Soup makes it to the menu, it is offering up comfort, ease, and consistency. There will be no bells and whistles on this one—that is not what diners are looking for when they pull into your pub, out of the cold, wet rain and take up a corner seat with a half-pint of Guinness and a warm bowl for lunch. Pub owners know this. What makes this particular soup different than others is the roasting of the broccoli, potatoes, and onion before blending. 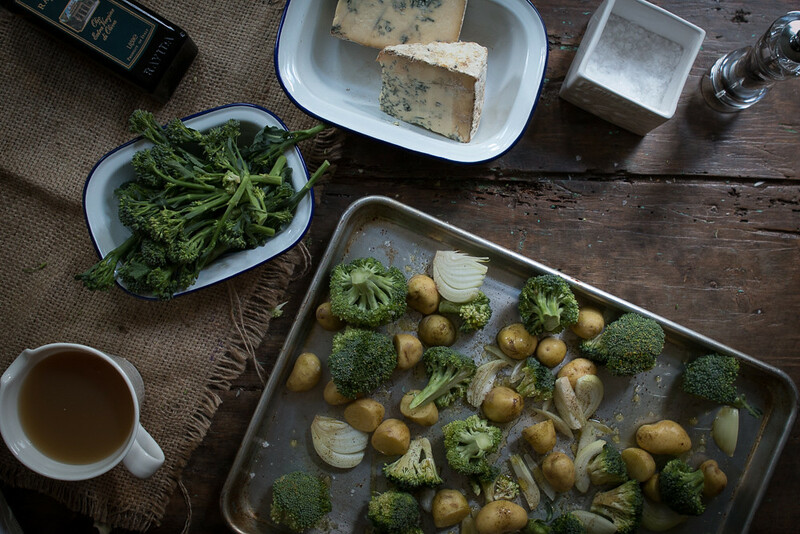 Roasting concentrates the flavors of the vegetables and creates a nuttiness that compliments the Stilton cheese’s buttery, rich, and peppery aroma and flavor. 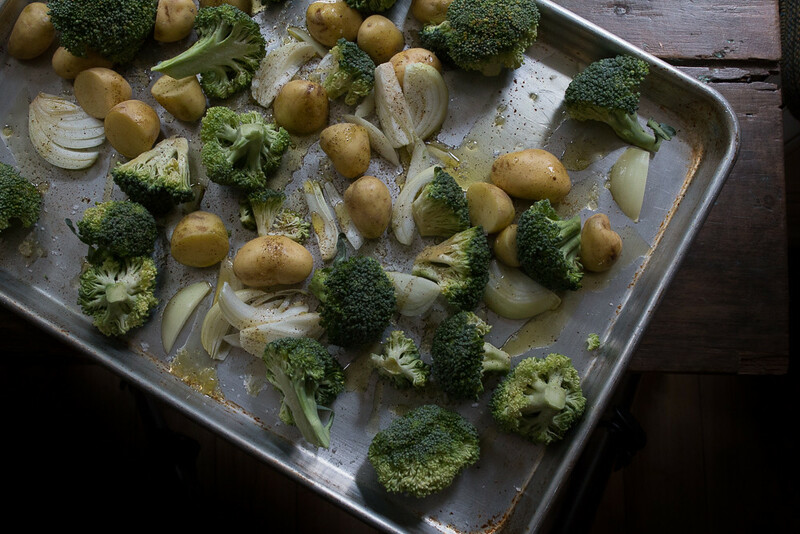 Despite the extra step, the simplicity remains: Even though vegetables are roasted in the oven, they are all cooked together, and then the roasting pan itself is deglazed on the stove. Not much is more comforting on a blustery, cold day in Britain than a hot, velvety soup in front of you, the steam fogging up your glasses as you wait impatiently to dive in and warm yourself from the inside out. Where necessary, cut the potatoes into halves or quarters so they are approximately 1-inch cubed. 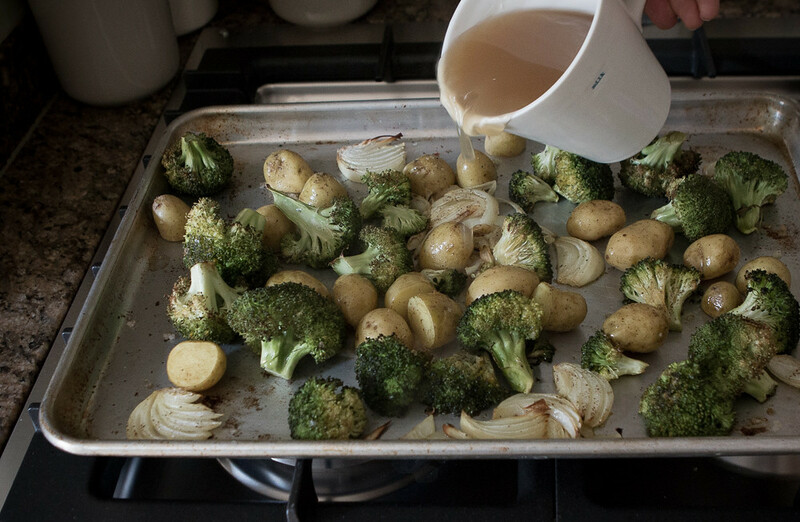 Trim the broccoli so that you have florets about twice the size of the potatoes. Slice the onion into half-moons. Combine them all in a single layer on a sheet pan with high edges and sprinkle with salt and pepper, and drizzle with the olive oil. Roast for 30 minutes, flipping once with a spatula about 20 minutes in. In a small saucepan, bring half of the chicken broth to a boil. Drop the broccoli rapini into the boiling stock for 15 seconds. Remove with tongs and set aside. Turn the heat down to low. Remove the sheet pan from the oven and place over two burners turned to medium-high. Add the other half of the chicken broth to the sheet pan and, using a spatula, scrape up any bits that have stuck to the pan. Working in batches, transfer the roasted vegetables and the liquid in the sheet pan to a food processor or powerful blender and blend for 60 seconds, or until fully puréed. (If your mixture is too thick to process, add in some of the warm chicken broth that has been waiting patiently on the stove. Continue to use that stock through the process to thin out your soup as desired.) Pour into a clean pot and place over low heat on the stove. Add the crumbled blue cheese to the pot and stir through the soup until it mostly dissolves. Then thoroughly whisk in the tablespoon of crème fraîche. Serve in generous bowls topped with crumbled Stilton and chopped broccoli rapini for garnish, accompanied with warm crusty bread.